THQ CEO Brian Farrell, apparent Lord of The Acronyms, has confirmed that THQ will be publishing a third game in the Red Faction series. The first two games drew a lot of attention when they were released, especially Red Faction 2 which featured 'geo-mod' technology. The Geo-Mod framework was supposed to allow completely destructible environments, but turned out to be a bit hit and miss in reality. Speaking in a conference call to GameSpot, Brian confirmed that the game will be developed by Volition. Volition previous developed Saint's Row, as well as the previous Red Faction games. 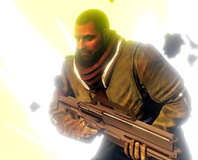 Details are still pretty scarce and thin on the ground, but Brian has hinted that Red Faction 3 will expand on the destructible environment features by harnessing the power of next-gen systems. The game doesn't currently have a specific release date, but is definitely in development for PlayStation 3, Xbox 360 and PC. Did you enjoy the original Red Faction? Are you looking forward to the new game? Let us know in the forums. Armageddon takes Red Faction's destructible environment underground. We check it out. 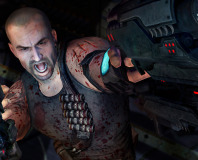 THQ has formally announced the release date and recommended specs for the PC version of Red Faction: Guerrilla. The economic climate isn't making things much better for publishers like THQ, who have posted increased losses this year.